We are hard at work transforming our lobby and dining area between now and June 1 2019. We apologize for any inconvenience and look forward to providing you with more of what you love. 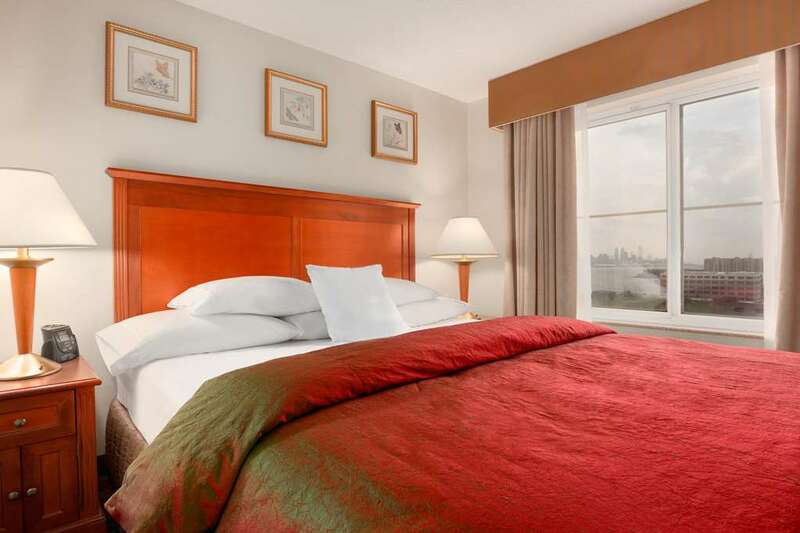 This hotel is 100pct nonsmoking The Homewood Suites by Hilton Edgewater-NYC Area NJ hotel overlooks Manhattan from the western banks of the Hudson River in New Jersey. The convenient location of Homewood Suites by Hilton offers you easy access to all of the Tri-State area*s corporate and industrial parks popular tourist sites and attractions. The Homewood Suites by Hilton in Edgewater New Jersey features 122 spacious studio /king/ suites and one-bedroom suites /with a king bed or two queen beds/. The EMPIRE Suites boast a Manhattan skyline view and a whirlpool tub overlooking the master bedroom. Our suites will make guests feel right at home and pampered with a fully equipped kitchen including a full-size refrigerator range top microwave dishwasher and coffeemaker. Each suite has a sofa bed in the living area. Large flat-screen TVs two-line telephones iron with ironing board and hairdryers are just a few of the amenities found at our Edgewater New Jersey Homewood Suites by Hilton hotel.